Find an engraved or personalized compass gift at The Compass Company. Compasses with custom engraving make perfect gifts for personal use, corporate awards, and recognition. 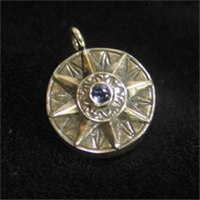 Sterling Silver Compass Rose Pendant with working compass: The sterling silver compass Necklace Pendant is set with a 14mm working compass (about the diameter of a dime). A 30" Sterling Silver Bead Chain - dangle your Compass Company pendant! The chain is a high quality, durable yet delicate, 100% sterling silver item. Custom Engraved Orders require additional process time.